As an attempt to honor those golden age performers that are still alive, I've made a little quiz. To make things a little more difficult, most of these people were/are not superfamous. Good luck! 1. This actress made her first screen appearence in the 1910s. In fact, she holds the distinction of being the only living person to have been in a film from that decade. Her parents were also actors. During her career, she had smaller roles in films with Peter Sellers, Audrey Hepburn and Cary Grant. 2. In the 30s, this actress was the stand-in for the leading role in one of the biggest films of all time. She survived a plane crash in the late 40s. Her younger sister, who also was an actress, died a couple of years ago. 3. This actress played a young mother in an Alfred Hitchcock film. Her husband was also an actor. Eventually, she became a psychologist and managed to win a book award in 2005. 4. 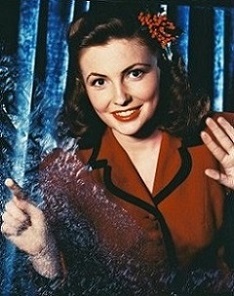 This actress had a contract with MGM between 1940-1945. She was in several Durango Kid films as well as some The Three Stooges movies. 5. This singer was born in Canada and dubbed the voices of stars such as Rita Hayworth, Jeanne Crain and Vera-Ellen. 6. This child actress was in silent Our Gang comedies in the 20s. Despite being a girl, she played a young boy in a movie that was based on a novel written by Harriett Beecher Stowe. In her later life, she was a dance teacher for students like Faye Dunaway, William Shatner and Cindy Crawford. 7. This actress had small roles in The Male Animal & Yankee Doodle Dandy but managed to get more substantial roles in a John Wayne film + 2 Film Noirs in the 40s. 8. This actor was in a 15-chapter serial in the late 40s. The serial was about one of the biggest superheroes of all time. 9. This singer & actress was in a John Wayne film in 1946 and in a Doris Day musical in the 50s. Her husband died in a plane crash in 1960. 10. This person was an American child actor of Chinese descent. He appeared in several pictures during the 30s. His daughter is a well known fitness expert. 11. While mostly known for his roles in the 60s and onwards, this guy managed to appear in several classic films during the golden age as an uncredited child. This includes The Ghost of Frankenstein, The Song of Bernadette, Going My Way, Meet Me in St. Louis, A Tree Grows in Brooklyn, Gilda and The Boy With the Green Hair. He is still working as of 2013.